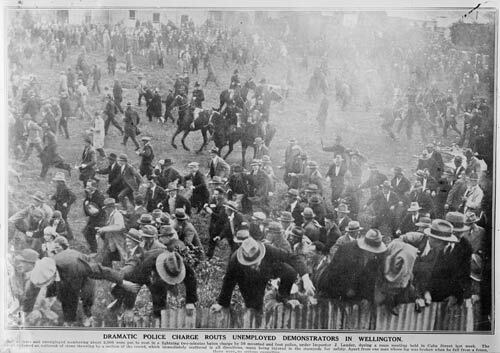 Mounted and foot police charge a demonstration of unemployed workers in Wellington's Cuba Street on 11 May 1932. Unemployment peaked in this period, with possibly more than 100,000 out of work. Protests by the unemployed the previous month in Dunedin and especially Auckland had turned into riots. On 10 May more than 4,000 unemployed people had demonstrated outside Parliament for several hours. When dispersing, some dozens of demonstrators smashed windows through downtown Wellington until stopped by police officers after about 20 minutes. Tensions ran high the following day and when the police commander moved to close down this meeting on empty land in upper Cuba Street, the crowd was very hostile. Mounted police moved in and mayhem ensued as the crowd was dispersed in a matter of minutes. There were claims and counter-claims as to whose actions – police or some of the demonstrators – had provoked the riot, but no public investigation was ever carried out.